You are currently browsing articles tagged fcc. “The Wars of (anti-)Encirclement Compaign” were a series battles between China Communist Party and the KMT‘s Nanjing Gorvernment in 1930s. At the time the CCP established a government in south-central China (mostly in Jiang Xi Province). The KMT’s army tried five times to attack and encircle the territory of CCP’s regime. And The CCP’s Red Army was almost defeated in the Fifth Encirclement War in 1934. The Long March followed the war and rescued CCP and its army. Encirclement is more than censorship. It’s a war strategy, and China has been at war with the Internet from the start. To operate in China, Google’s local search engine, Google.cn, had to meet these “self-discipline” requirements. When users typed words or phrases for sensitive subjects into the box and clicked “search,” Google.cn was responsible for making sure that the results didn’t include forbidden content. It’s much easier to force intermediary communications and Internet companies such as Google to police themselves and their users than the alternatives: sending cops after everybody who attempts a risque or politically sensitive search, getting parents and teachers to do their jobs, or chasing down the origin of every offending link. Or re-considering the logic and purpose of your entire system. Intermediary liability enables the Chinese authorities to minimize the number of people they need to put in jail in order to stay in power and to maximize their control over what the Chinese people know and don’t know. In its bombshell announcement on Jan. 12, Google cited massive cyber attacks against the Gmail accounts of human rights activists as the most urgent reason for re-evaluating its presence in China. However, the Chinese government’s demands for ever-increasing levels of censorship contributed to a toxic and unsustainable business environment. I’m not equating Western democracy with Chinese authoritarianism — that would be ludicrous. However, I am concerned about the direction we’re taking without considering the full global context of free expression and censorship. I’m not saying that we shouldn’t fight crime or enforce the law. Of course we should, assuming that the laws reflect the consent of the governed. But let’s make sure that we don’t throw the baby of democracy and free speech out with the bathwater, as we do the necessary work of adjusting legal systems and economies to the Internet age. To stop that theft, the MPAA and RIAA want to make sure that any new FCC rules allow ISPs to act on their behalf. Copyright owners can certainly act without voluntary ISP assistance, as the RIAA’s lengthy lawsuit campaign against file-swappers showed, but both groups seem to admit that this approach has now been hauled out behind the barn and shot. “No industry can, or should be expected to, compete against free-by-theft distribution of its own products,” the brief adds. “We thus urge the Commission to adopt rules that not only allow ISPs to address online theft, but actively encourage their efforts to do so,” says the RIAA. And that’s how we get the American Cinternet. Don’t encircle it yourself. Get the feds to make ISPs into liable intermediaries forced to practice “self discipline” the Chinese way: a “graduated response” that encircles the Net, reducing it to something less: a spigot of filtered “content” that Hollywood approves. Television 2.0, coming up. 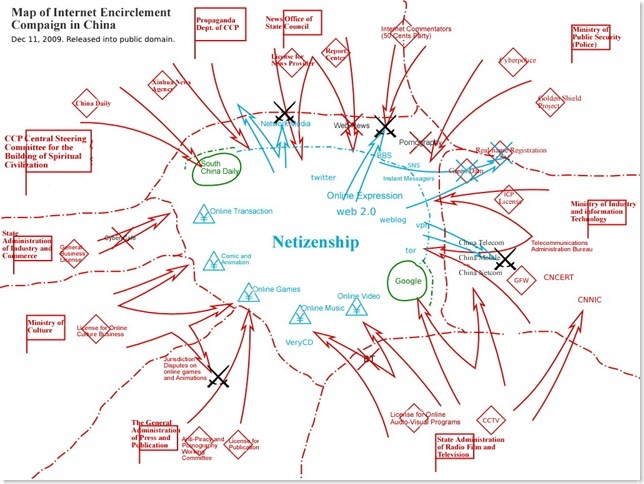 Maybe somebody can draw us the Content-o-net. Tags: "Net Neutrality", Ars Technica, Big Content, China, Cinternet, Content-o-net, Donnie Hao Dong, encirclement, fcc, france, google, Hollywood, intermediary liability, internet, ISP, MPAA, Net, Rebecca MacKinnon, RIAA, self-discipline, U.S.
Every student that takes a class has to create or improve a Wikipedia page to the topic of the class. It shouldn’t be the only deliverable, but an important one. The Wikimedia organization could help the professors with tools, that highlight the changes that a certain user has done on a page. You only pass, when the professor is satisfied with the scientific validity of the page. One could even mark the pages that went through this vetting process differently. Instead of creating papers that end up in a drawer, you would create pages that you even feel ownership of and would make sure that they stay current and don’t get vandalized. You could even link to them on you LinkedIn profile. It would make an enormous difference to the quality of Wikipedia year over year. One can think of wiki-how and other pages that could be improved using the same model. All 811 services in the U.S. will end up using 611 by early 2007, as the United States Federal Communications Commission (FCC) in March 2005 made 811 the universal number for the 71 regional services that coordinate location services for underground public utilities in the U.S.[dated info] Currently, each of these “call before you dig” services, has its own 800 number, and the FCC and others want to make it as easy as possible for everyone planning an excavation to call first. This safety measure not only prevents damage that interrupts telecommunications, but also the cutting of electricity, water mains, and natural gas pipes. Establishment of an abbreviated dialing number for this purpose was required by the Pipeline Safety Improvement Act of 2002. 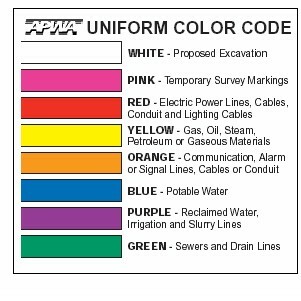 One-call, Miss Utility, or Underground Service Alert are services that allow construction workers to contact utility companies, who will then denote where underground utilities are located via color-coding those locations. 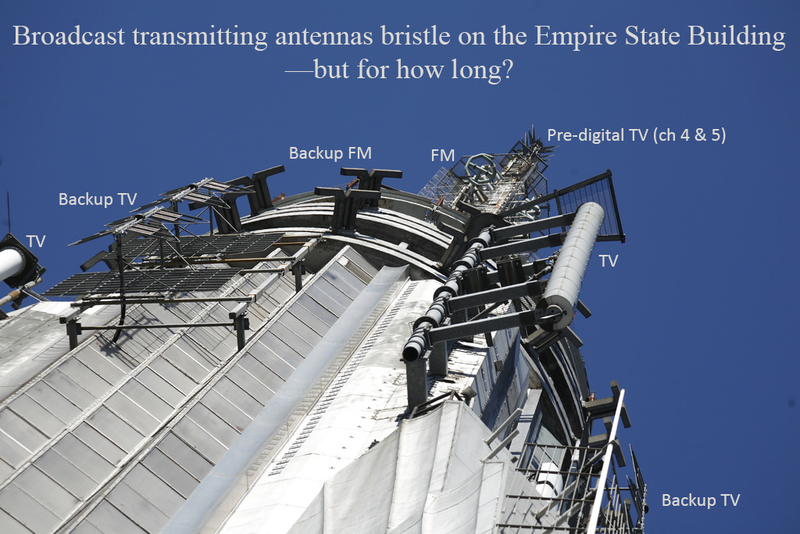 As required by law and assigned by the FCC, the 8-1-1 telephone number will soon be used for this purpose across the United States. Well, it’s already being used. And it’s way freaking complicated, because there’s this very uneven overlap of entities — federal government, state goverenments, regional associations, and commercial entities, to name a few — that all have something to say. Guidance for implementing safe and effective damage prevention for underground utilities was established by the Common Ground Alliance (CGA), a national organization representing all underground utility stakeholders. Calling before you dig is the first rule to remember when conducting underground related activities, no matter what the job is. 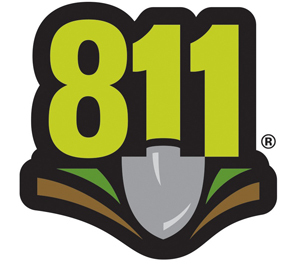 The law requires you to phone the “One-Call” center at 8-1-1 at least two days prior to conducting any form of digging activity. 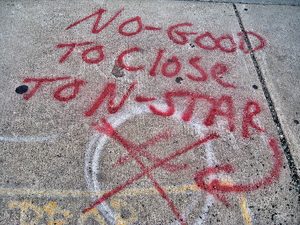 No link to the Common Ground Alliance. That org (a domain squatter has its .org URL, so it’s a .com) explains that it’s “a member-driven association dedicated to ensuring public safety, environmental protection, and the integrity of services by promoting effective damage prevention practices.” Its news page mentions that, among other things, August 11 is “8-11 Day”. It has a press release template in Word format. It also has news that “MGH Hired as CGA 811 Awareness Contractor” in .pdf. Within that one finds MGH’s website URL, where one finds that the agency is @mghus, which may be the hippest thing in this whole mess. What is Dig Safe ®? State laws require anyone who digs to notify utility companies before starting, and for good reason. Digging can be dangerous and costly without knowing where underground facilities are located. Dig Safe ystem, Inc. is a communication network, assisting excavators, contractors and property owners in complying with state law by notifying the appropriate utilities before digging. Dig Safe®, a free service, notifies member companies of proposed excavation projects. In turn, these member utilities respond to the work area and identify the location of underground facilities. Callers are given a permit number as confirmation. I found out all of this — and much more — while I was researching for my column in the November issue of Linux Journal, which has Infrastructure the issue’s theme. I’m leveraging my leftovers here, closing one tab after another in my browser. I’m also interested in approximately everything, one of which is the official-looking public graffiti on the ground all over the place. These are known locally as “dig safe markings”. At least that piece of the scattered one-call/call-before-you-dig/8-1-1 branding effort has taken root, at least here. Anyway, I’d love to see a Wikipedia entry or two that pulls all this together. Maybe I should write it, but I’m busy. Hey, I’ve done this much already. Some actual experts ought to pick up the ball and post with it. Which brings us back to Mark’s suggestion in the first place. Have a class do it. Hey, @mghus, since you’re in Baltimore, how about suggesting a Wikipedia page project to The Civil & Environmental Engineering Department at UMBC?